Today’s show featured an interview with Sandra Moran – International Human Rights Activist, Musician, feminist and prison rights advocate. (begins at about 14 min mark) Over the past 3 decades, she’s played an important role in peace negotiations in Guatemala and its women’s, cultural and prison rights movements. Sandra joined the Guatemalan human rights movement at 14 and during the 1980s became involved with Guatemala’s renowned rebel music group Kin Lalat. Her human rights and musical activism made her a target for death squads and by the late 1980s, she was forced into exile, first in Nicaragua, then Mexico and finally to Vancouver, Canada. In 1994, she returned to Guatemala City to co-found the Women’s Sector, an alliance of 33 women’s groups that represented Guatemalan women during peace negotiations that ended Guatemala’s 36-year civil war in late 1996.As a representative of the Women’s Sector, Sandra was a founder of the National Women’s Forum, which developed public policies on women’s rights in the post-war period. 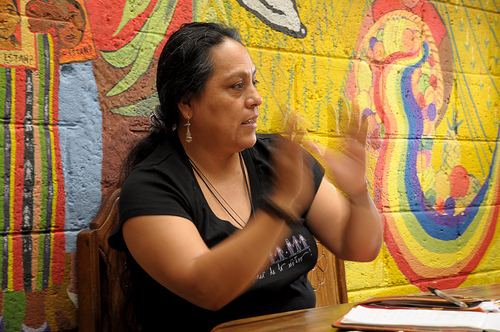 In 1995, Sandra also founded “We Are Women”, Guatemala’s first lesbian collective and was a central organizer of Guatemala’s first gay pride parade.In 2006, she co-founded Casa Artesana (Guatemala City) as an alternative meeting place and artistic space for women and other groups facing discrimination. With funding from CoDev and Vancouver’s Hawthorne Foundation, Casa Artesana works to improve living conditions for women in Guatemalan prisons and their children, and provides rights training and advocacy support for women prisoners. Sandra continues to perform percussion and poetry, and in 2011 helped form the band “Centro-America Feminista,” made up of prominent women singer-songwriters from several Central American countries.